According to Baseball America, the Red Sox have signed pitchers Charlie Haeger and Christian Perdomo to minor league contracts. The team has also signed first baseman Lyle Overbay and pitcher J.D. Durbin to minor league deals. Overbay, perhaps the most notable of the group, received an invitation to spring training and will look to compete for a spot on the Red Sox bench. According to Scott Lauber of the Boston Herald, Overbay can opt-out of the deal if he is not on the major league roster by the end of spring training. The 36-year-old played just 65 major league games last season between Arizona and Atlanta, hitting .259/.331/.397 with two home runs and 10 RBI. The left-handed hitting first baseman spent the majority of his career with the Toronto Blue Jays, hitting .312/.372/.508 with 22 home runs and 93 RBI in his best year in 2006. BOSTON, Mass. -- Though right-hander Brandon Workman put up a respectable 3.71 ERA while playing for Low A Greenville in 2011, it was his season last year that vaulted him into position as one of the top pitching prospects in the organization. 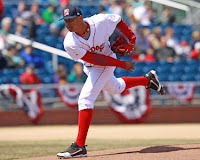 His move from outside the top 20 prior to last season in the SoxProspects.com rankings to his current spot at 12 is no surprise after winning the organization's 2012 Minor League Pitcher of the Year honors while making the difficult transition to upper minors. BOSTON, Mass. -- It is tough to imagine how 2012 could have gone worse for Anthony Ranaudo. His season started late and ended early due to injuries, and in between was nothing to write home about either. However, speaking recently at the New Stars for Young Stars fundraiser in Boston, the 23-year-old right-hander is optimistic and feeling completely healthy heading into next season. 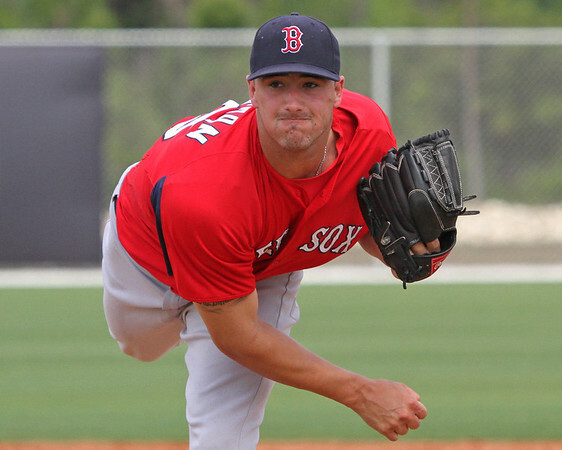 After achieving relative success in his first season with the Red Sox in A-Ball, Ranaudo strained his groin in spring training heading into 2012 and did not make his first start until May 15. It was anything but smooth sailing once he arrived at Double-A Portland though, as he posted a 6.69 ERA in just nine starts. The former first-round pick gave up exactly as many walks as he had strikeouts, and allowed more hits than he had innings pitched. He made his final start on July 3 before being shut down with shoulder fatigue after tossing just 37 2/3 innings. With some fresh audio from the Jimmy Fund's New Stars for Young Stars event, the guys discuss five players and their upcoming seasons. The Winter Leagues wrapped up their playoffs this week as the squads taking part in the Caribbean Series were set. In the Australian League, the regular season came to a close as the playoffs are set to begin this week. Mauro Gomez went 0 for 9 in the final two games of the Dominican League Championship. Mauro's team, Escogido, defeated Aguilas 5-0 to take home the Dominican League crown. Escogido will be one of four teams in the Caribbean Series starting on Friday. Jose De La Torre (pictured) made two appearances out of the bullpen this week for Caguas. On Wednesday, De La Torre tossed 1 2/3 innings, allowing one run on two hits while striking out one. In the series clincher on Friday, De La Torre pitched a clean eighth inning as Caguas beat Mayaguez to win the championship four games to two. Jason Urquidez made his lone appearance in Game Five of the Puerto Rican Championship for Mayaguez, hurling 2 1/3 scoreless innings of relief and striking out two. According to Rob Bradford of WEEI.com, the Red Sox have brought back outfielder Ryan Sweeney on a minor league deal. 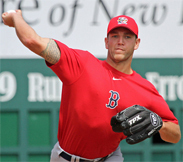 Sweeney returns to the Red Sox organization after a very difficult 2012 that culminated on July 30 when he broke his hand punching a door in frustration, eventually requiring season-ending surgery. He had missed time earlier in the year with a concussion, but even when healthy he only managed a .260/.303/.373 line which lead to him being non-tendered by the team last December. Sweeney was originally acquired by Boston in a deal last off-season that sent Josh Reddick, Miles Head, and Raul Alcantara to Oakland in exchange for Sweeney and Andrew Bailey. The deal did not go as GM Ben Cherington had planned when Bailey and Sweeney missed significant parts of the season with injuries while Reddick enjoyed a breakout year with Oakland. Outfielder Ryan Kalish is likely miss spring training and the start of the regular season, according to a report by Matthew Stucko of milb.com. Rob Bradford of WEEI.com confirmed the report that Kalish will need surgery. The surgery will be on his right non-throwing shoulder and performed by Dr. Lewis Yocum next week according to multiple reports. Kalish previously had surgery on the torn labrum in his left shoulder in November 2011. The Red Sox officially announced today the long-anticipated signing of free agent Mike Napoli. To clear a spot on the 40-man roster, right-hander Chris Carpenter has been designated for assignment. Marrero excited to be returning to "special place"
BOSTON, Mass. 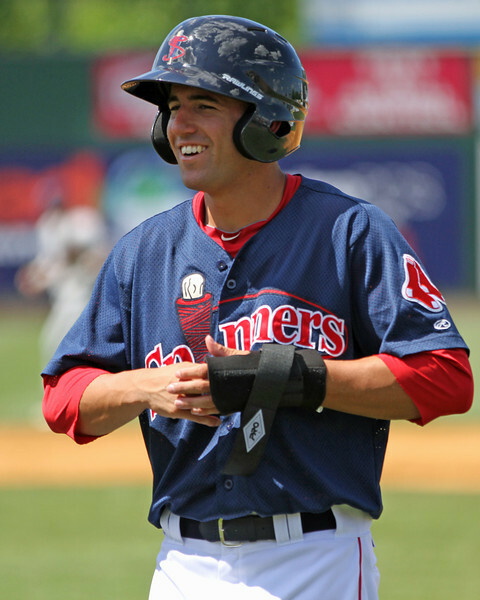 – Boston’s first overall pick in last year’s draft had no expectation that he was going to be selected by the Red Sox, but shortstop Deven Marrero knew exactly what kind of passion to expect from Red Sox Nation after playing in the Cape Cod League as an amateur in 2010. At the Jimmy Fund New Stars for Young Stars event on January 19, Marrero sounded like he was hooked on the baseball environment after his time spent on the Cape. He exuded enthusiasm for how the draft process went and his current situation with the team. The Caribbean League Playoffs continued as the Dominican and Puerto Rican leagues began their championships this week. Mauro Gomez went 3 for 23 with a home run and six RBI this week as Escogido took a 3-0 lead over Aguilas in the best of nine series. BOSTON, Mass. -- Saturday was the eighth New Stars for Young Stars event at Jillian’s Boston, the annual Jimmy Fund fundraiser that gives fans a chance to meet and get autographs from some of their favorite Red Sox, past, present, and future. Sox prospects Anthony Ranaudo, Blake Swihart, Garin Cecchini, Deven Marrero, and Brandon Workman were in attendance at the event, joining Red Sox pitchers Rich Hill, Chris Carpenter, Craig Breslow, and Clayton Mortensen, and 2004 World Series winning-catcher Doug Mirabelli. Mortensen came in for just the day and was flying out of Boston the same night to be at his son's first birthday party the next day. He was not alone among players making special arrangements to be there, but all had a positive outlook and were happy to give their time. 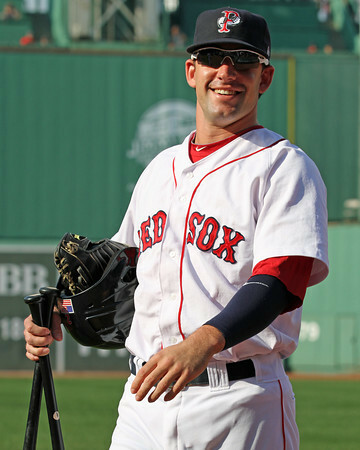 "This is awesome man," said Marrero, Boston's first overall pick in the 2012 draft. "This is something that I like to do a lot. I like to do this for the kids and for the fans of Boston. It's special and it's really humbling to see these people out here. It's cool I'm having fun with everybody." Four Red Sox players have been added to the provisional rosters for the World Baseball Classic, including top prospect Xander Bogaerts, who will be playing for the Kingdom of the Netherlands. In addition to Bogaerts, major leaguers Shane Victorino and Alfredo Aceves will play for Team USA and Mexico, respectively, while reliever Jose De La Torre is on the Puerto Rico roster. The Annual New Stars for Young Stars event will take place this Saturday from 11 AM to 1:30 PM at Jillian's in Boston. Tickets are still available for the event and can be purchased at jimmyfund.org/new-stars or by calling 1-800-52-JIMMY. There will also be tickets available for purchase at the door. All proceeds go to the Dana Farber Cancer Institute and the Jimmy Fund. The Caribbean League Playoffs continued as the Panama and Australian League regular seasons began to wind down. Mauro Gomez went 4 for 17 with a home run, double, triple and four RBI. Tony Pena Jr. was busy this week as he appeared in four games. In 3 1/3 innings of relief, Pena allowed two runs on five hits while striking out three. A clean inning of work on Sunday against Este earned Pena the victory. The Boston Red Sox and Portland Sea Dogs announced on Friday night a four-year extension of their Player Development Contract. The deal means Portland will remain a Boston affiliate through the 2018 season. Can’t wait for baseball season to start? To hold you over, here’s a look on ESPN Boston at what the Red Sox full-season minor league affiliate rosters might look like when the minor league season opens on April 4. Quite a few prospects changed hands in the six-player deal that brought new closer Joel Hanrahan to Boston. The Red Sox acquired infielder Brock Holt, who debuted at #16 on the SoxProspects.com rankings. Stolmy Pimentel (pictured), ranked #20 at the time of the deal, was the primary prospect heading to Pittsburgh. The right-hander peaked at #5 at the beginning of the 2011 season. There was a great deal of Red Sox-related activity in the Rule 5 draft at the Winter Meetings. Relievers Josh Fields and Ryan Pressly were selected with the first and fourth overall picks by the Houston Astros and Minnesota Twins, respectively. With the seventh pick, the Red Sox nabbed second baseman Jeff Kobernus from the Nationals, and flipped him to the Tigers for utilityman Justin Henry. With the Caribbean League playoffs in full swing, a limited amount of Red Sox participants made an impact in winter leagues this week. Mauro Gomez remained one of the most consistently productive hitters for Escogido. Gomez went 5 for 18 with a home run, double, and three RBI in four games this week. Escogido is currently 5-3 in the round robin playoffs. Tony Pena Jr. made two appearances this week. On Thursday against Pena tossed 2 innings, allowing one run on four hits while striking out two. In another 2 inning performance on Friday, Pena walked a batter and struck out two. Aguilas is currently 5-3 in the playoffs. The Red Sox announced the signing of Mark Hamilton to a minor league contract, with an invitation to spring training. Primarily a first baseman, he has also seen time at the corner outfield spots. 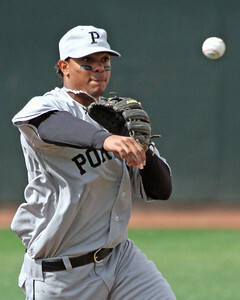 Hamilton, 28, has spent his entire professional career with the St. Louis Cardinals after they took him in the second round of the 2006 draft. After compiling over 1700 minor league plate appearances, Hamilton got his first taste of the majors with the Cardinals in 2010. Appearing in 47 games across two seasons, Hamilton went 12 for 61, driving in four runs. Assigned to Triple-A Memphis of the Pacific Coast League in 2012, he compiled a .231/.340/.419 line before he was released on August 17. Hamilton has an impressive .291/.385/.494 overall line with Memphis in over 900 at-bats across four seasons, but his power has not yet translated in his short major league auditions. SoxProspects, LLC is pleased to announce the additions of Matt Huegel and Jon Meoli as shareholders and Members of the LLC. 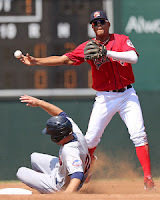 SoxProspects, LLC owns SoxProspects.com and all related media, including SoxProspects News and the SoxProspects Forum. We here at SoxProspects.com want to wish a Happy New Year to all of our readers! To celebrate and get in on the whole "countdown" bandwagon that everyone loves at this time of year, here's a list of our top 10 most-read stories of 2012. Interestingly, all of the posts are from June and later. Perhaps Red Sox fans needing some good news turned to the team's minor leaguers for some hope after things went south in the majors? At any rate, the lists hits on a number of topics: some breaking news, some analysis, and a lot of scouting. Thanks for all of your support in 2012. Here's to a great 2013! Chris Mellen and Ian Cundall filed this report from the Fall Instructional League on some of the exciting younger prospects in the system, including Blake Swihart, Cody Kukuk, and Keury De La Cruz.